The state of Michigan, which has several cities with sizable gay scenes (Detroit, Grand Rapids, Lansing, Ann Arbor, Kalamazoo) as well as arguably the Midwest's most popular gay resort community, Saugatuck, celebrates its Gay Pride Rally and Festival in late August. The festival takes place in Michigan's capital city, Lansing, but it draws some 15,000 spectators and participants from all over Michigan and the Midwest. Be sure to check out the Michigan Pride Events page, for information on several related gatherings over the weekend, which include the Friday night Michigan Pride White Party, the Rally at the Capitol, March to the Capitol, and the Pride Festival. 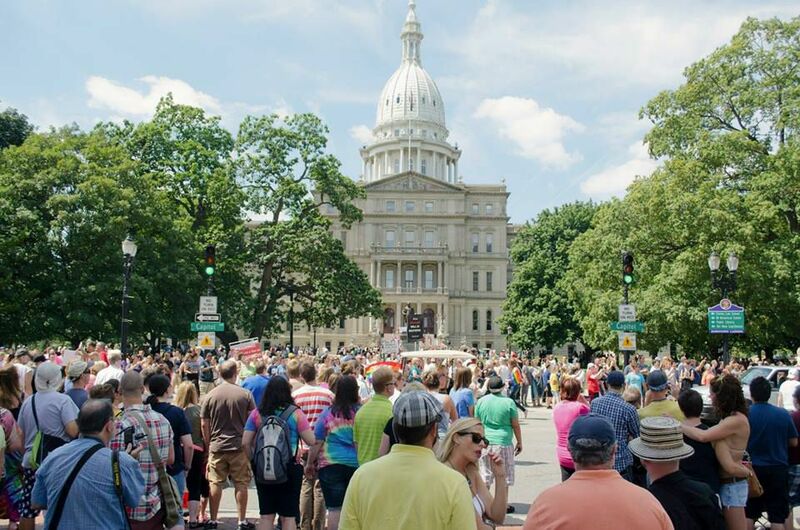 The Michigan Pride Parade typically sets off at noon, Saturday, commencing at Adado Riverfront Park, winding through downtown, and ending at the steps of the Michigan State Capitol building. This is followed by a rally and then the Pride Festival. Many gay-popular bars, as well as restaurants and other businesses, have special events and parties throughout Pride. Check local gay papers, such as Metra Magazine and Between The Lines/Pride Source for details. Also take a look at the useful travel site produced by the city's official tourism organization, the Greater Lansing Convention & Visitors Bureau.